The entire success of the nation depends on the youth. The young people in Azerbaijan play a major role in the implementation of political, economic, humanitarian and social activities. They ensure a successful future for their country thanks to patriotism, activity, strength and power. Azerbaijan annually celebrates the National Youth Day on February 2. From that time Azerbaijan became the first country among the CIS and Eastern Europe states to solemnly celebrate this day. National Youth Day is celebrated with a series of events. The Voice of Youth festival will open at the International Mugham Center on February 1 as part of the holiday. The event is co-organized by State Agency for Public Services and Social Innovations, Trend Life reported. The festival will feature concert programs, meetings, photo and art exhibitions, theater productions and films with participation of young people. 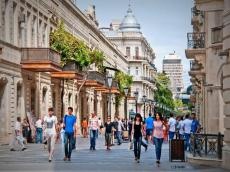 An exhibition timed to the Youth Day will also open in Baku. The event will take place at Leyla Khazari Art Gallery on February 5. About 50 paintings by more than 30 young artists will be exhibited. In addition, sale of paintings will also be organized as part of the event. The event is co-organized by the Ministry of Culture and the Azerbaijan State Art Gallery.